An infrared sauna is a special type of sauna that basically uses light to create heat. 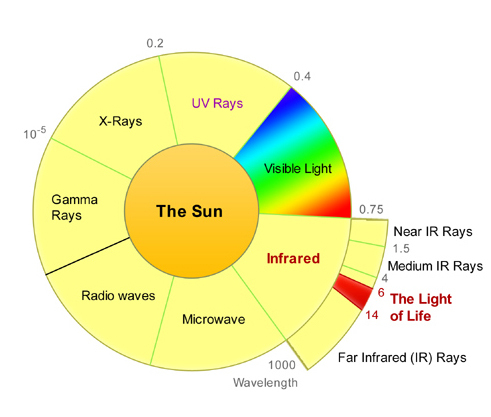 You might also hear them called Far-infrared because fardescribes where the infrared waves fall on the light spectrum. It’s on the same wavelength of light that gives life to the entire plant kingdom! 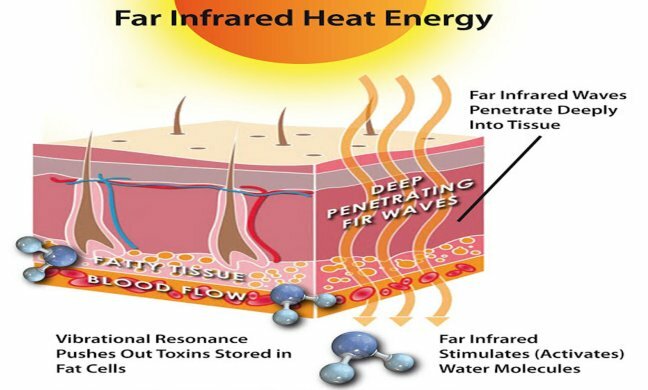 Far infrared rays are the most vital to health and healing. Far infrared rays also stimulate endorphins (the happy brain hormones! ), kill bad bacteria and parasites and most importantly, penetrate into the body to detoxify cells. the antidote to excess ultraviolet and EMF radiation. It’s even been shown to heal sun damaged skin, including wrinkles and fine lines! Whole body infrared therapy has been used for over 80 years by German physicians. In 1965 it was used exclusively by medical practitioners in Japan until being released for public use in 1979. Infrared therapy has been studied extensively for decades and no adverse effects have ever been reported. The American Journal of Medicine conducted a meta-review of all the studies on sauna use from 1966 to the present and concluded that infrared sauna use is safe and has therapeutic value for healthy people as well as heart disease patients. They are even safe for kids, pets and pregnant women. Hospitals have been using infrared heat for decades for premature newborns. NASA even uses infrared heat to maintain cardiovascular conditioning in astronauts during long space flights! The majority of top hospitals, cancer facilities and holistic doctors around the world use and recommend whole body infrared therapy for healing and disease prevention. All types of saunas will make you sweat and doing so helps flush out toxins. The skin is a major detox organ, but the truth is, many of us don’t sweat nearly enough these days. We sit in air conditioned rooms all day and night. And if we do workout, most of us workout in an air conditioned environment where it’s really hard to work up a good sweat. Sweating in any type of sauna (or any situation!) is a good and welcome practice to release toxins via the skin. However, the benefits of infrared saunas go much deeper and are much safer than a conventional sauna. The type of heat in an infrared sauna penetrates the skin deeply (1.5” to 6”!!!) aiding in many restorative body processes that are not available through a conventional sauna. Because infrared heat penetrates the skin so deeply and heats the body from the inside out rather than just heating the skin superficially like a conventional sauna, the infrared sauna is able to eliminate toxins and speed oxygen flow deep into the muscles, joints and internal organs. It’s able to remove impurities from cells, specifically the cells inside fat where the body stores waste and harmful toxins such as heavy metals, dozens of pesticides, cleaning agents, endocrine disrupting hormones, alcohol, and nicotine. Also because infrared energy travels so deep into the body, it’s able to regenerate damaged tissues and strengthen immune cells while weakening and killing viruses, pathogens and harmful bacteria. The far infrared sauna is the only type of sauna proven safe for the elderly and for severe end-stage heart patients because the temperatures are much lower than a conventional sauna (the temperature is much lower and much more pleasant in the far infrared sauna, but you will sweat 2-3 times the volume of a conventional sauna!). There is a fascinating study from the Mayo Clinic that reported the far infrared sauna was the only thing that was able to improve late-stage heart failure patients with zero side effects when nothing else could be done by medicine. And the improvement took place in just 3 short weeks! Bottom line: The sweating is deeper, more profuse and will enable your body to excrete a higher percentage of toxins through an infrared sauna. An infrared sauna also aids in many healing processes not available through a conventional sauna.